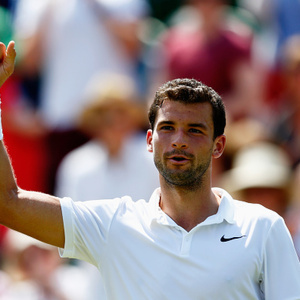 How much is Grigor Dimitrov Worth? Grigor Dimitrov net worth: Grigor Dimitrov is a Bulgarian professional tennis player who has a net worth of $8 million. Grigor Dimitrov was born in Haskovo, Bulgaria in May 1991. He turned professional in 2008 after winning Junior Grand Slam titles at Wimbledon and the US Open in 2008. Dimitrov achieved his highest career ranking of #8 in August 2014 and became the most successful Bulgarian male tennis player of all time with more than $8 million in prize money during his career. He reached the semifinals at Wimbledon in 2014 as well as at the Australian Open in 2017. Dimitrov won his first ATP title at the 2013 Stockholm Open and has won a total of six ATP titles. In 2012 he represented Bulgaria at the London Olympic Games and he also competed for his home country at the 2016 Rio Olympics. In 2014 Dimitrov was named the Bulgarian Sportsperson of the Year. Grigor Dimitrov has been romantically linked to singer Nicole Scherzinger.